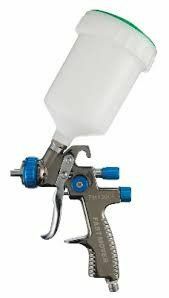 Our top selling LVLP (low volume low pressure) high transfer efficiency gravity feed top coat spraygun. Suitable for water and solvent based paints. Operates with a very low air consumption, just 4.2-6cfm depending on the setup specified. Ideal for those with smaller compressors. Can be used with 3M disposable pot system, use adaptor number 2 (3M code 16032). Colour coded for easy setup identification. A well balanced and high performing gun.